* Polished Tips Wake up the performance and sound hidden in your V6-powered 2011-2013 Mustang with a Flowmaster Force II exhaust system. 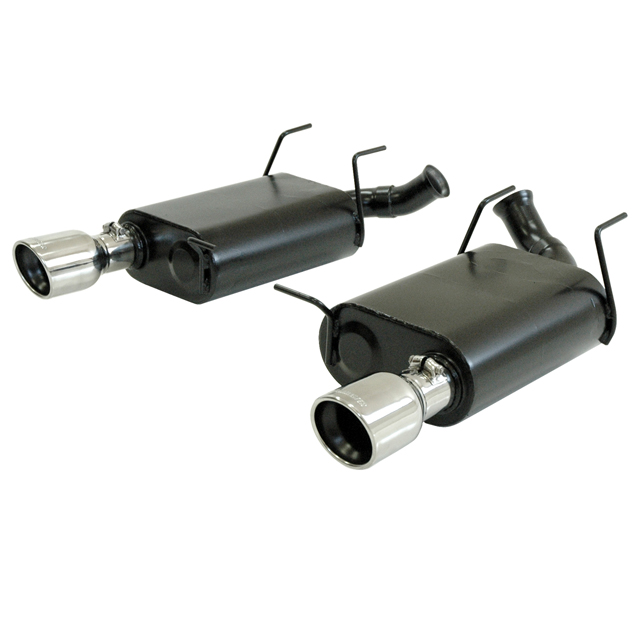 These moderate sounding systems retain the dual exhaust system outlets and are designed to replace the original rear mounted mufflers using factory hangers and connections. With easy fit in mind, these systems are mandrel bent for maximum performance and include specially tuned mufflers. As a Force II system, it delivers a moderate exterior tone and a mild interior tone and is suited to the enthusiast who wants a subtle but distinctive exhaust note. Like all Flowmaster systems, the benefits include improved throttle response, power and mileage. The kit is a true bolt-on and includes everything you need to easily install at home with basic hand tools. No one else gives you the bold clean styling of our Aftermarket Dress Ups, Suspension and Performance Parts for your American Muscle Car like UPR Products! Click Here for Instructions Click Here for Dyno Results Fits these Vehicles: 2011 2012 2013 V6 Mustang Roush & Saleen Vehicles.